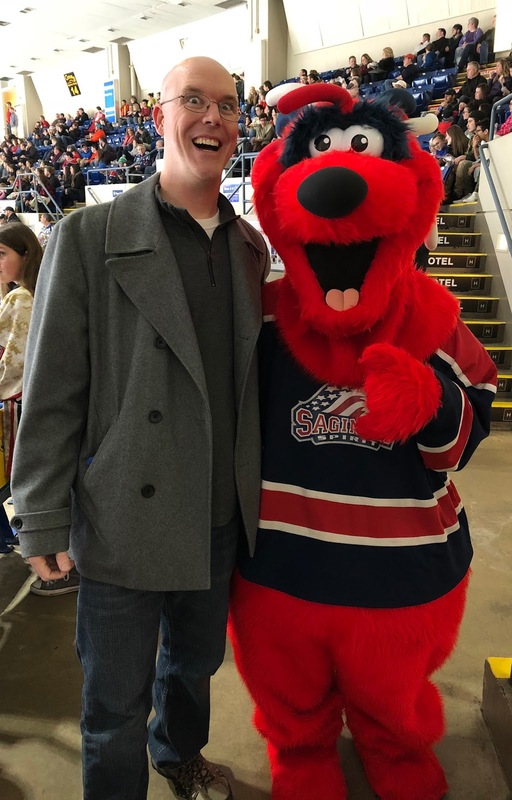 I first became familiar with the team in 2006, when they conducted an online contest to choose a new mascot: TV host Stephen Colbert came up with an idea - affectionately named "Steagle Colbeagle the Eagle" - and successfully convinced his Colbert Report viewers to cast enough votes to secure the victory. Meanwhile, Chad had been collecting various jerseys to wear throughout our hockey quest, and had coincidentally purchased a Saginaw Spirit jersey several years ago. Temperatures had dropped as the sun went down, and we arrived just before the game started. 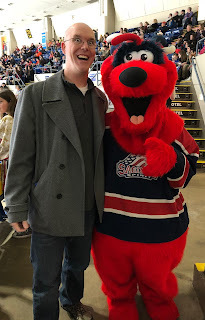 Lucky for me, a Spirit season-ticket holder decided not to attend the game and left two free tickets at the box office for the next customer in line, which the cashier gladly handed to me as I approached! We walked around inside the arena, stopped for some delicious pulled pork from Olvera's BBQ, then took our seats in the corner. It wasn't the most exciting game - Saginaw would lose 3-0 the visiting Sarnia Sting - but I certainly enjoyed the "small town Friday night" vibe that was evident, which featured lots of families and friends chatting each other up. 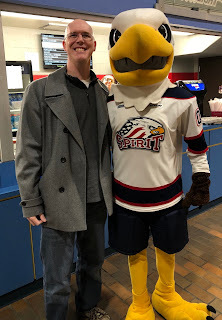 As an added bonus, there were TWO mascots roaming the arena - sadly, Steagle Colbeagle was not in attendance, but Sammy (the bald eagle) and Burt (the ?????) were there to entertain the fans. We ducked out just as the final horn sounded, and ventured back to Ann Arbor at the end of an exhausting day. No rest for the weary though, as tomorrow would be just as busy. 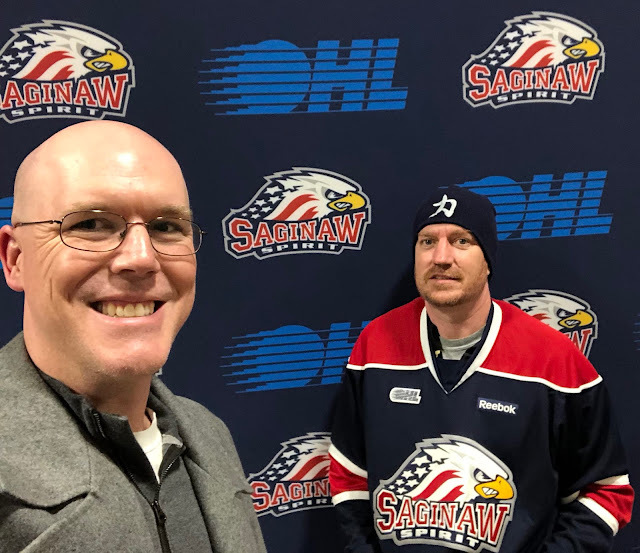 So long from Saginaw! We got an early start and headed to the capital city of Lansing, beginning our day at the Michigan History Center. 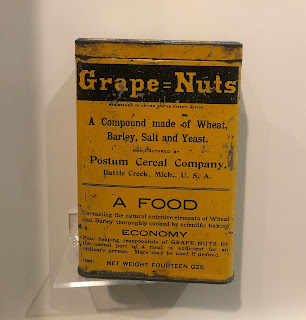 Over the course of several hours, we would learn all about the state itself, from its Native American roots to the industrial and technological advances of the 19th century - as one would imagine, there was also a strong emphasis on the evolution of the automobile. I took a detailed interest in the music and sports history, but was also fascinated by the development of the cereal business in Battle Creek, aka "Cereal City", highlighted by the manufacturing efforts and rivalry between Kellogg's (whose "corn flakes" were invented in 1894) and Post (creator of Grape Nuts in 1897). 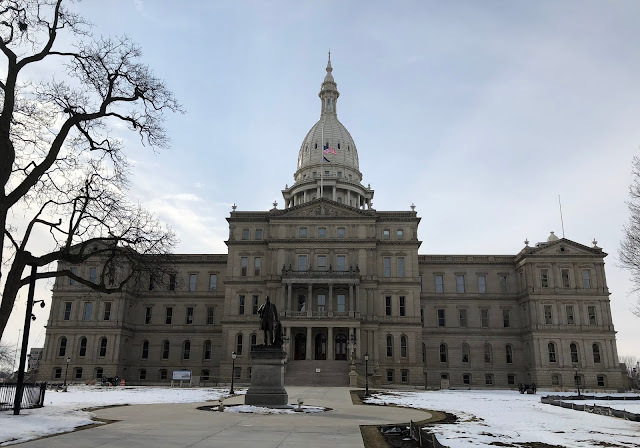 We hurried along to the nearby Michigan State Capitol, where we were given an informational hour-long tour of the majestic building, just before it closed for the day. We then moved across town to East Lansing, and the campus of Michigan State University. 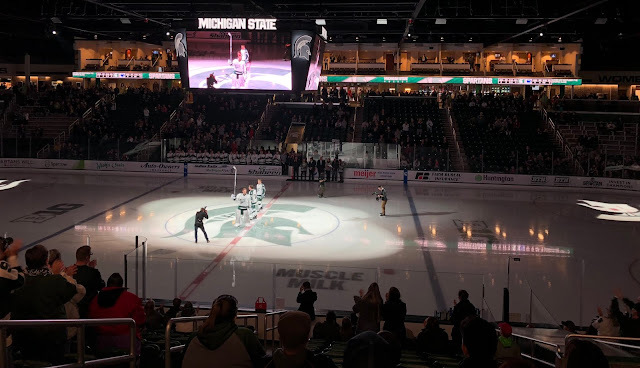 Tonight would be the final home game for the MSU hockey team - "Senior Night" for three of the Spartans - and after a quick trip to the bookstore to buy some merchandise, we walked to Munn Arena for the evening's festivities. Each of three seniors was introduced to the adoring crowd, and then the game got off to quick start: a very fast-paced first period would see the visitors from Penn State take a 2-1 lead into intermission, before stretching the lead to 3-1 in the following frame. 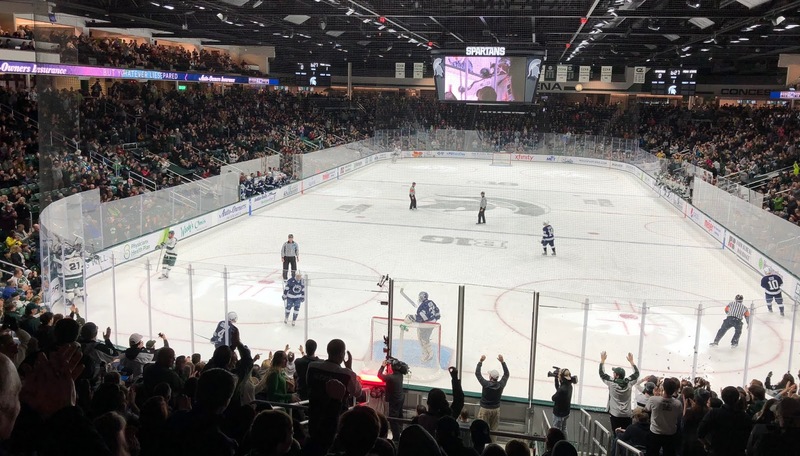 The Spartans would storm back in the final period, before ultimately falling short by a final score of 3-2. We asked the fans sitting around us to suggest a nice campus spot for a late dinner, and HopCat was the most popular choice. Good music, great food and a cool atmosphere - it was a little crowded, which was to be expected for a Saturday night, but we finished up and made it back home before it got too late. The driving was kept to a minimum, as we would spend a very frigid day at the University of Michigan in Ann Arbor, which started with a pleasant walk around the sprawling campus. From there, we did some shopping at The M Den on Campus, a massive two-story outlet specializing in ALL of your Michigan Wolverines-related clothing and souvenirs. We had two events on tap for the day: a matinee basketball game against the hated arch rivals from Ohio State AND an evening hockey tilt against another dreaded rival, the Fighting Irish of Notre Dame! We arrived at the Crisler Center to see hordes of Michigan fans coming in from the cold - once we made it inside, we walked around the wide concourse which featured photos and artifacts showcasing many of the school's notable alumni. I always had a great admiration for their legendary hockey coach Red Berenson, so it was nice to see him well represented with various items on display. After a brief ceremony to honor the Wolverines seniors, the game got off to a torrid pace. 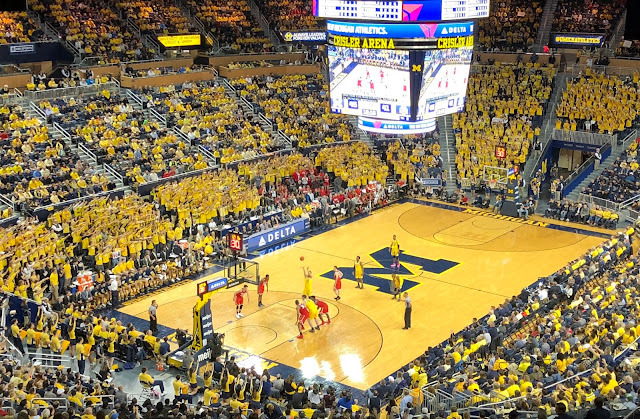 This was a nationally-televised contest with important implications for both teams within the Big Ten conference, and they played their hearts out. Michigan would ultimately prevail, and we got to be part of the raucous crowd to see it! 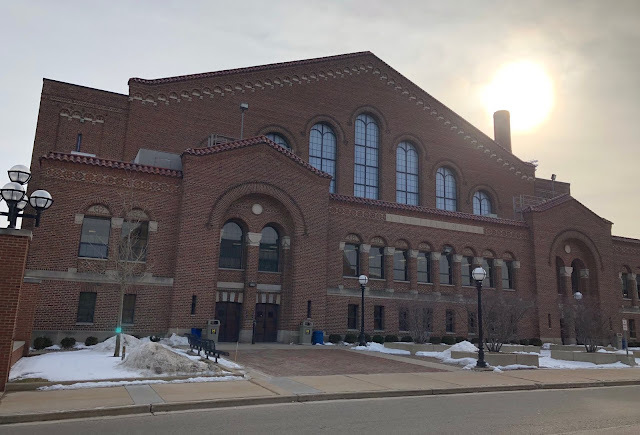 After a quick stop for lunch, we made our way to the another revered building in college sports: the Yost Ice Arena, which opened in 1923. 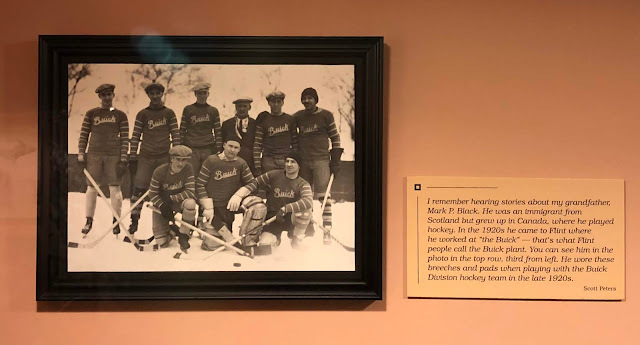 Just like the Crisler Center, there was a nice display of pictures and memorabilia to honor the former stars at the Yost Ice Arena - I vividly remember the Wolverines winning the National Championship at the 1998 Frozen Four, and the current team was on a strong run of their own. After defeating the top-ranked Notre Dame team on the road the night before, the rematch in Ann Arbor would be a very hard-fought defensive contest with neither side giving an inch. We had great seats close to the ice, but the combination of the uncomfortable metal bleachers and some very obnoxious fans behind us led me to seek out a standing room section at the end of the rink. We got to our new spot just in time to see the game's lone goal, scored late in the second period by senior Tony Calderone! 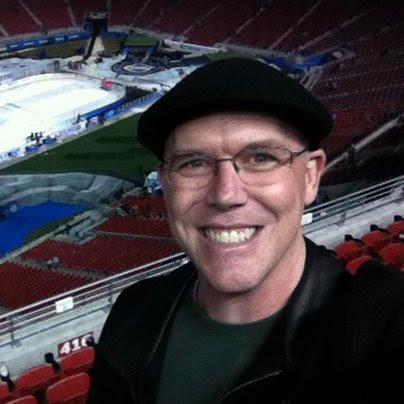 And then a funny thing happened: there were several fans standing in our section that looked like professional scouts (I see them at games all the time and they tend to look and dress alike), and I couldn't help but notice that we were situated right next to Keith Tkachuk. A veteran of 1200 NHL games who was a favorite of mine during his nine seasons in St. Louis, he was now serving as a scout for the Blues and was generous enough to briefly chat with me during the second intermission. We talked about his sons - Matthew is already a burgeoning star with the Calgary Flames, while his younger brother Brady would be a Top-5 pick in the 2018 NHL Entry Draft - and I even jokingly asked Keith if he had played against the fathers of any of the skaters who were on the ice that night. It was a welcome surprise to bump into him and he couldn't have been any nicer! As mentioned, the Wolverines held on for a 1-0 victory, much to the delight of the home fans. We stuck around long enough to see the players salute the band playing at rinkside, then headed home for the night. While Americans celebrate President's Day on the third Monday of February each year, many of our neighbors to the North use the same time to observe a holiday known as Family Day. As a result, we were able to drive up to Sarnia, Ontario for an afternoon OHL contest. Since Chad wasn't able to join me on my previous visit to Detroit, he wanted to make sure we stopped along the way at Joe Louis Arena so he could take a picture (and so did I). I had already seen three of the Great Lakes at this point, so here was my best chance to visit Lake Huron, which was only a short drive from Sarnia. It was a very gloomy day as we drove up the coast of Michigan to Port Huron, a charming town nestled against the lake. We parked the car at Lighthouse Park and walked around the snow-covered landscape, amazed by the towering Fort Gratiot Lighthouse! 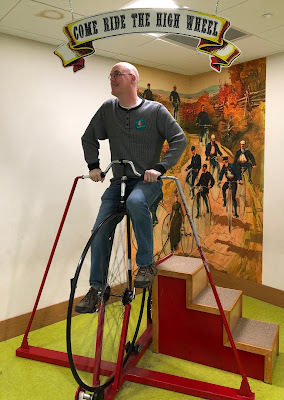 We then headed to the nearby Thomas Edison Depot Museum, located underneath the remarkable Blue Water Bridge, which spans the two countries. 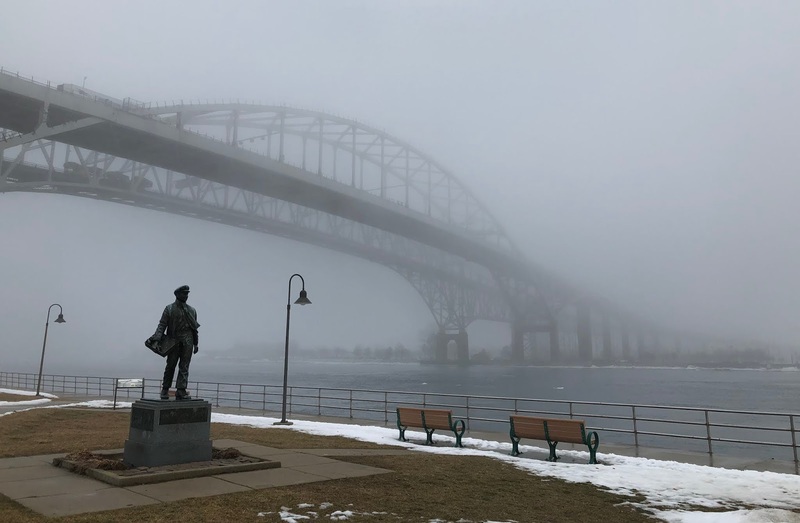 The famed inventor grew up in Port Huron, so the town erected a statue of the young Edison near the museum. 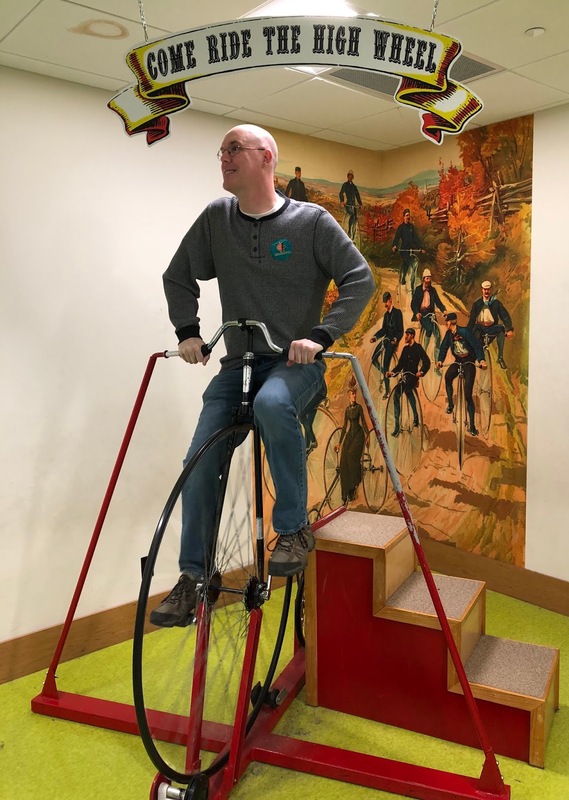 Since it was the dead of winter and not the most popular time for tourists, both the lighthouse and museum were closed to the public - but that didn't stop us from enjoying the scenery during our short stay. The rain had started to pick up by the time we arrived at Progressive Auto Sales Arena, home of the OHL's Sarnia Sting. 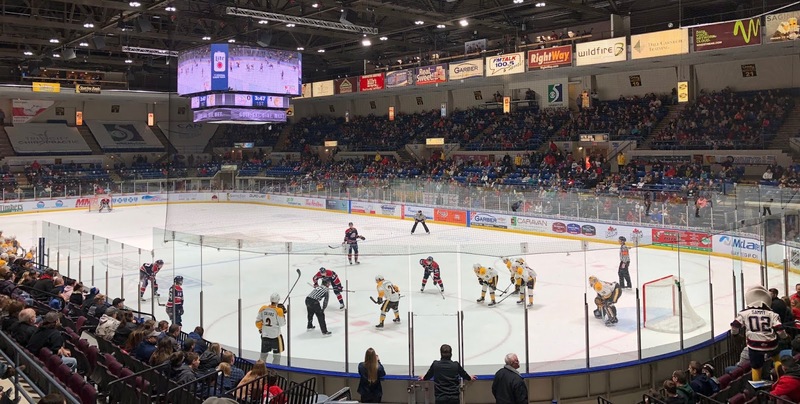 In a rematch of Friday's game, the Saginaw Spirit were in town and the Sting showed them no mercy, jumping out with three goals in the first period en route to a 6-1 drubbing. St. Louis Blues draft pick Jordan Kyrou was the absolute standout, skating circles around the Saginaw defense like a man among boys. The fans were roaring and we had a great time - we hit the concession stand for a true "Canadian lunch" (pulled pork poutine and All Dressed chips, courtesy of Smoke's Poutinerie), and I even managed to get my mascot photo! Does it get more Canadian than this?!?! We returned to Michigan as night fell, using the free evening to grab dinner with my old boss Rob, a Detroit native who had moved back to the area with his family. We hadn't seen each other in a little over a year, and he wanted to show us a taste of the local cuisine, so he suggested Buddy's Pizza. I wasn't overly familiar with Detroit-style pizza, but it was fantastic! For dessert, I ordered a float made with another of the region's greatest exports, Vernors Ginger Ale. Me and the old boss back together again! It was wonderful to spend a few hours catching up with Rob, but it was also great to be reunited with Charlene, as we picked her up from the airport later that night. The second half of the trip would soon commence.